Make-up lessons, free make-up colour consultations, special occasion make-overs and bridal packages complete our range of make-up services offered in the application and use of Kryolan professional make-up. 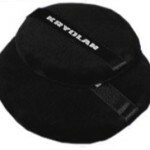 Kryolan professional make-up is ideal for everyday use and is also used for film, TV, stage and theatre. Kryolan Ultra Foundation Cream is a cream foundation specially formulated for the most demanding make-up expectations. As a result of its excellent covering quality, Ultra Foundation is also effective as a corrective make-up. Transparent application of Ultra Foundation is also suitable for photographic work. Its matt finish provides models with a naturally attractive appearance. The Ultra Foundation formulation contains advanced ingredients that are recognized for particularly good skin compatibility. Designed to meet the most demanding professional requirements, our foundation contains additives soothing to the skin, assuring maximum comfort. Application of Ultra Foundation is soft and supple, but still produces a natural matt look. The base and the micro-fine pigments used in this make-up mean that Ultra Foundation is perfectly suited for flawless camera results as well as superb everyday wear. This preparation, in other words, is the make-up for film,TV and photography. This foundation is available in a wide range of more than 30 shades. Kryolan Ultra Fluid Foundation is well suited to many skin types and has proved outstanding in providing a gentle, smooth and uniformly applied make-up. Ultra Fluid is distinguished by slightly enhanced covering quality, without loss of its transparent appearance. Ultra Fluid Foundation comes in a glass bottle with applicator. These foundations are available in a range of more than 30 shades. 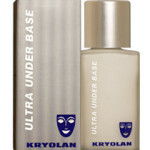 Kryolan Ultra Cream Powder is a natural, gentle make-up speciality for everyday, TV and film applications. Application of Ultra Cream Powder is effortless, also by its extremely ultra-fine particle consistency. Its silky-soft, hydrophobic powder film also ensures lasting adherence to the skin. Models have discovered Ultra Cream Powder to be exceptionally friendly to their skin. Powder particles coated through innovative techniques, as well as new colors – in conjunction with sophisticated micronization technology – have enabled the development of Ultra Cream Powder. 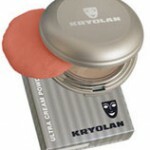 Kryolan Dual Finish is a creamy soft-feeling make-up in an elegant compact, for moist or dry application. In dry form, this preparation is similar to cream powder and is effective in lightly tinting and shading the skin. This exclusive formula is best applied dry and followed by a moist latex sponge, setting and finishing for a perfect foundationapplication. Moist application enables greater covering quality and color intensity on the skin. Dual Finish can be gently removed with AquaCleans, or effortlessly with soap and water. 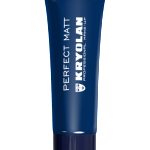 Kryolan Ultra Brush-on Concealer is a cream make-up to conceal shadows under the eyes, as well as slight discolourations of the skin. This light, but effectively covering concealer corrects and cares for the area of skin involved. Brush-on Concealer is offered in a practical, handy applicator with integrated brush. The Brush-on Concealer is available in the colors shown here. Perfect Matt is a velvet-soft gel that acts to smooth out irregularities on the surface of the skin. At the same time, it forms a film that serves as an outstanding base for variousmake-up preparations – and that greatly enhances the durability of the make-up applied. The gel-like consistency of Perfect Matt also increases the moisture resistance of the foundation. Perfect Matt is the ideal matting agent for a face before it is made up. It is especially suited for the natural look in professional photography. The vitamin complex contained in Perfect Matt means at the same time that it effectively cares for the skin. Under Base is the preliminary step in making up. Ultra Under Base, applied ultra-thin,allows professional application of the Ultra Foundation line and of TV Paint Stick. A synergistic effect enhances the durability of the make-up. Covers and corrects skin discolorations, scarring and tattoos. 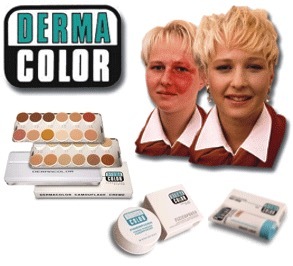 Derma Color Camouflage Cream is available in various shades. The Camouflage System is designed to correct skin imperfections or discolorations whether they are of accidental, dermatological, surgical or congenital origin. Derma color Camouflage System is especially effective in camouflaging post surgical conditions either aesthetic or medical. Its effectiveness and quality are proven in intensive and long-term use under clinical supervision. A large number of available skin tones and corrective tones including orange, mint green and lilac allow a natural appearance when applied as directed. With proper use of the Derma color Camouflage System skin abnormalities in both color and texture can be easily corrected, resulting in both weatherproof and long-lasting effects. With the most advanced Camouflage System the stress and psychological factors arising from such skin problems are lessened and the user experiences greater confidence and comfort. The program is effective for men, women and children. Toxic or allergic reactions have rarely been observed with Dermacolor Camouflage System. Waterproofs, sets and mattes Camouflage Cream. Dermacolor Fixing Powder is in two different sizes available. Used for extra protection of the camouflage. Especially suitable for hands and neck. Fixing Spray is applied after setting the camouflage with Fixing Powder. Contains sun protection filter US-SPF 25. The eyes are the key element for an expressive make-up. 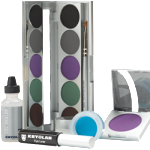 Kryolan’s extensive range of creative preparations provide the ultimate tools for the perfect eye make-up. Kryolan eye make-up conforms to the strict stipulations of European, American, and Japanese cosmetic regulations, and can be used anywhere in the world. For make-up artists busy on a global basis, this assurance fulfills an essential prerequisite for international work. Professional eye make-up must satisfy a wide range of requirement: outstanding skin tolerance, exceptional product quality, excellent comfort, unmatched effectiveness, and superior suitability for the camera. The micro fine pigments in Kryolan eye shadows achieve superior results on camera. Even at high resolution, these pigments create a homogeneous appearance on the eyelids. Our technical advanced double micronization process assures a soft, velvety finish, as well as a long-wearing application. 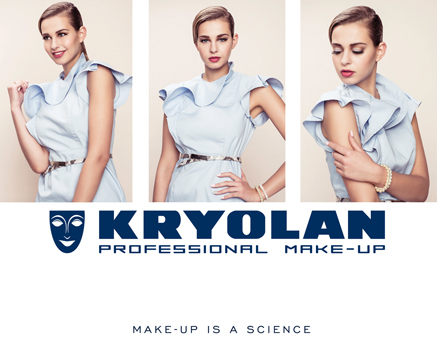 The other Kryolan eye make-up preparations are formulated according to professional expectations and requirements, and are tested by professionals under realistic conditions. These products includeKryolan Eye Liner, Mascara, Eyebrow Pencil, and AQUA Pearl Shades. Qualified safety assessments documented the skin tolerance of these products, which have been further confirmed by expert dermatological studies. A creamy powder shadow for dry application. A new formulation and innovative production technology provide gentle application and produce a pleasantly soft feeling on the skin. 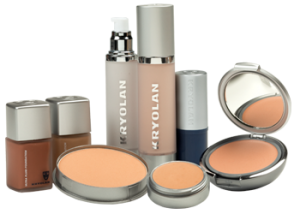 Kryolan Eye Shadow is available in an elegant round container with window and as palette godet. This elegant, slim-designed set with mirror contains three shadows. The Trio-Set is made up on request, with your choice of 3 colours from the vast range of Kryolan Shadow colours available. This 3-shade palette is also refillable. Professional Eye Shadow Set, with 8 colors of your choice. True Matte shades, Pearlescent shades with entrancing effects and the ultimate variety of colours available. 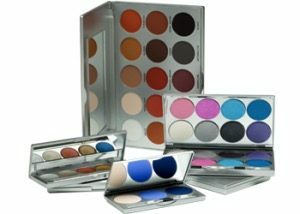 The attractive, sleek, compact 8-shade Kryolan Eye Shadow pallet gives great versatility, and is refillable. This elegant refillable palette consists of 15 different eye shadow colors, of your choice. The Professional Eye Shadow Set is available as an empty palette to be filled by the artist from the available color range. Iridescent, micro-fine eye dust powder for brilliant shimmer effects. A total of 48 pearlescent colors. Creates extraordinary impressions on eyelids and skin. Cake Eye Liner Sealer is an innovative preparation created especially for theprofessional make-up artist to effectively help him or her provide perfect eye make-up. Cake Eye Liner Sealer seals the applied eye liner, enhances its durability and improves moisture resistance. The sealer is thinly applied over the eye liner after it has dried. This sealer preparation can, however, also be directly employed to line the eyelid: the brush is first wet with Cake Eye Liner Sealer and the moist brush is then used to apply Cake Eye Liner. Liquid eye liner in a dispenser with a high-quality eye-liner brush. Maximum control, outstanding staying power. Available in Black & various colours. Moist-applied compact eye liner in an elegant dispenser. Powder consistency to liquid finish, available in black, blue, green and brown. The special base of this preparation provides a colored,high-volume mask of mascaraaround each eyelash, giving it a stronger, more vigorous and thus highly accentuated appearance. This mascara, though, still feels soft and flexible and is well-known for its wear ability. 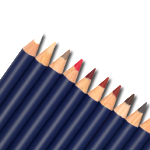 Wide pencil with a soft texture for easy blending and intense colour, producing thicker, bolder lines. Excellent for big stages where make-up tends to disappear. Requires a large sharpener. Soft textured contour pencils in Classic, Iridescent and Fashion shades. These special sharpeners keep all Kryolan pencils in good shape. The built-in compartment to catch the shavings is particularly practical. Hydrophilic cleansing oil for easy removal of all cream and grease make-up. 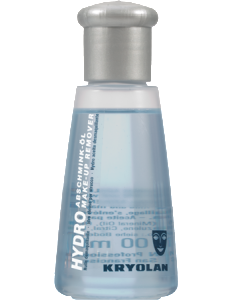 Hydro Make-up Remover Oil is evenly massaged into make-up areas of the skin, which causes the make-up to gently dissolve. Make-up and Hydro Oil are then easily removed from the skin with warm water. After make-up has been removed, the skin feels fresh and relaxed. Sponge wedges made of natural latex, for precise, uniform application of cream make-up. 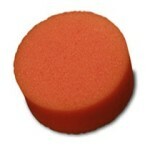 Six pre-cut sponge wedges are delivered in hygienic, cellophane-wrapped packages. This finepore make-up sponge of high-quality polyurethane has been produced in unchanged form and quality for decades now. It is especially effective for all kinds of wet-applied cosmetics, as well as for cream make-up. Elegant powder puffs, hand-sewn from the finest of black European Brilliant cotton velvet. These powder puffs can be gently machine-cleaned with washing powder made for fine fabrics, also with washable sponge insert. The short velvet pile with high density is especially effective in the application of powder. 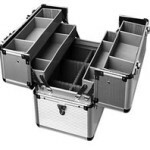 An aluminum case opening to the top, with twin 2-step stowage platform, individual subdivision of these areas, and large storage space at the bottom of the case. Includes a lock. 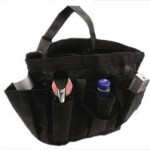 Make-up artist’s bag made of sturdy, washable material with a shoulder strap. For the artist on the move, an extensive make-up assortment can be stowed so as to be well organized and easily accessible.